Malcolm Gladwell has been a staff writer with The New Yorker magazine since 1996. His 1999 profile of Ron Popeil won a National Magazine Award, and in 2005 he was named one of Time Magazine's 100 Most Influential People. He is the author of three books, "The Tipping Point: How Little Things Make a Big Difference," (2000) , "Blink: The Power of Thinking Without Thinking" (2005), and "Outliers: The Story of Success" (2008) all of which were number one New York Times bestsellers. It's a book about rapid cognition, about the kind of thinking that happens in a blink of an eye. When you meet someone for the first time, or walk into a house you are thinking of buying, or read the first few sentences of a book, your mind takes about two seconds to jump to a series of conclusions. Well, "Blink" is a book about those two seconds, because I thinks those instant conclusions that we reach are really powerful and really important and, occasionally, really good. 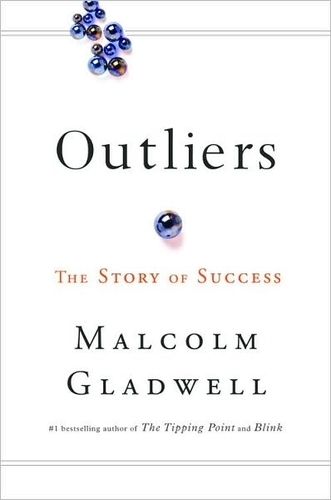 "Outlier" is a scientific term to describe things or phenomena that lie outside normal experience. In the summer, in Paris, we expect most days to be somewhere between warm and very hot. But imagine if you had a day in the middle of August where the temperature fell below freezing. That day would be outlier. And while we have a very good understanding of why summer days in Paris are warm or hot, we know a good deal less about why a summer day in Paris might be freezing cold. In this book I'm interested in people who are outliers—in men and women who, for one reason or another, are so accomplished and so extraordinary and so outside of ordinary experience that they are as puzzling to the rest of us as a cold day in August. I have the first two, but the Outliers. Will find this Outliers to complete the series of one of the most inspiring yet fearing kind of writing, where patterns of human psychology were discussed in details, while on the usual day, we often miss from seeing this patterns on how human, literally speaking, could change the world. yea u should buy it. good investment. totally interested.. u sure u weren't in advertising? neh~ they ain't paying me jack for this.